I am certainly no wine connoisseur, but I like to think I know my way around reds enough to be dangerous. 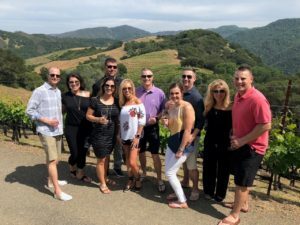 Recently, my wife and I took some time off with friends and ventured to Napa Valley, home to one of the world’s best grape growing and wine producing regions. 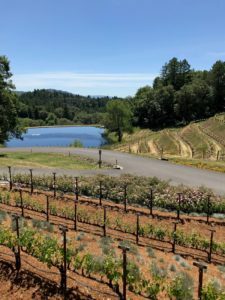 With a little planning and a lot of Uber, we made our way to eleven different wineries: V. Sattui, Elyse, Kuleto Estate, Peju Province, Domaine Chandon, Caymus, Robert Mondavi, Chateau Montelena, Castello di Amorosa, Pride Mountain, and Inglenook. We also stopped for wine and lunch at the famed Oakville Grocery (trust me – just go there) and hit the Russian River Brewing Company (Pliny the Elder!) as a nice departure from the vino. Though not unexpected, Napa wines are definitely on the pricey side, if not outright astronomical. While my wife and I may enjoy a solid $10-15 bottle of wine at home, wines in Napa routinely run $50 – $100+. Now, most people tend to think the more you pay, the better the wine. So, the question I found myself asking was, “could my somewhat sufficiently trained palate tell the difference?”. More on that in a moment. One of my character flaws is I lack an ability to shut-off my business and investment mind, even while enjoying an abundance of wine. As I sat in these beautiful vineyards, I couldn’t help but think of Vanguard’s Jack Bogle who said, “In investing, you get what you don’t pay for”. As it turns out, in investing, there is an inverse relationship between cost and performance. In other words, the lower the cost of your funds, the higher likelihood of better performance/quality – the exact opposite of how people tend to view wine. The below chart shows the pattern of lower cost funds experiencing higher success ratios (defined as funds surviving and outperforming their category groups). This holds consistent across different asset classes. In other words, if a wine drinker is unaware of price, they are unable to distinguish between the more and less expensive wines – and actually like the pricier wines a bit less. Why? Ultimately, taste is subjective. Fruity, earthy, oaked, tannins, velvety… depends on what you like. Are there better quality wines than others? Of course. But beauty is in the eye of the beholder. One of our friends couldn’t tell you the difference between Caymus and a fermented Capri Sun! Back to investments. Some investors believe higher price equals higher quality, just like with wine. The word “cheap” often carries negative connotations. If you go out for dinner, do you want a “cheap” wine or a “fine” wine? Do you want to drive a “cheap” car? Wear “cheap” clothes? But in the investment world, “cheap” should be viewed as a positive. Consider the growth of a $10,000 investment at different fee levels (0.2%, 1%, and 2%) over 25 years assuming a 7% annual return. The point here is hopefully obvious. When it comes to investments, wine, or anything else, it would be a mistake to instinctively assume higher price equals higher quality. With wine, this appears to be subjective. With investments, there is hard data to back up Jack Bogle’s famous line that “you get what you don’t pay for”.